Connor, our Health & Safety Coordinator, has been hard at work with his studies in recent months and is seeing the rewards for his efforts. Firstly he has completed the CITB Site Management Safety Training Scheme (SMSTS). The Construction Industry Training Board was first established in July 1964 and has been providing training for the construction and civil engineering industries ever since. The SMSTS is run over 5 days and provides an understanding of health, safety, welfare and environmental issues on construction sites. Connor has also received his BTEC Level 2 Diploma in Business Administration from Gloucestershire College. The Diploma covers a number of learning outcomes vital for management in business including analysing and presenting business data, developing working relationships with colleagues, managing personal performance and development and understanding employees’ rights and responsibilities. Finally, Connor has passed two parts of the NEBOSH National General Certificate in Occupational Health and Safety. This qualification covers the main legal requirements for health and safety in the UK, identification and control of workplace hazards, and the practical application of this knowledge. Connor has passed GC2 and GC3 and is due to take NGC1 in December 2017. Following completion of this qualification, Connor will be able to complete site visits and reports autonomously. Connor will then move onto the National Certificate in Construction Health and Safety and he is aiming to complete this course in March 2018. 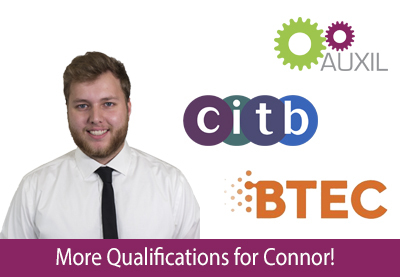 We are very pleased with Connor’s progress, and are sure that the experience gained from obtaining these qualifications will help him continue to grow into his professional career with us.